We’d love your help. Let us know what’s wrong with this preview of A Simple Faith by Rosalind Lauer. Rushing to the scene of a tragic highway collision, nursing student Haley Donovan draws on her training to care for the passengers in the crumpled van. T For fans of Beverly Lewis and Cindy Woodsmall, Rosalind Lauer’s uplifting Lancaster Crossroads novel A Simple Faith brings together disparate lives in a warm Amish setting. To ask other readers questions about A Simple Faith, please sign up. So I just finished A Simple Faith today.... and I could NOT wait to tell you about it. Let's get started. Book Review for A Simple Faith, publisher: Ballantine Books, Oct. 29, 2013, 384 pages. Here is a summary of the book from the publisher: Rushing to the scene of a tragic highway collision, nursing student Haley Donovan draws on her training to care for the passengers in the crumpled van. The experience wins her a place in Lancaster County’s tight-knit Amish society, and draws her to kindhear So I just finished A Simple Faith today.... and I could NOT wait to tell you about it. Let's get started. Here is a summary of the book from the publisher: Rushing to the scene of a tragic highway collision, nursing student Haley Donovan draws on her training to care for the passengers in the crumpled van. The experience wins her a place in Lancaster County’s tight-knit Amish society, and draws her to kindhearted psychologist Dylan Monroe. Working side by side with Dylan, who is bringing counseling services to the small town of Halfway, Haley feels an undeniable attraction between them, yet she senses that Dylan is holding back, scarred by the wounds of his past. This is the first book I have read by Rosalind Lauer and trust me when I tell you it will not be the last. I mean for one thing, it is book one in a series. You know how I love a series right? I mean we just talked about that recently. In my "book" ha ha ha yes... pun intended... a series of thick books is the cherry on the sundae of just one thick book! Or maybe its the fudge... cause in my book the fudge is way better than the cherry.... This is book #1 in the Lancaster Crossroads series so score there. For the second thing? It looks like Rosalind has lots more Amish Fiction... so of course I must check that out immediately. Anyway... where were we? Oh yes... The book! So good. Loved the characters. Loved the story. Loved that it was a little out of the ordinary of your average Amish Fiction story with more involvement from "Englishers", and a nice little dual romance story line going on too. It gets your adrenaline going with a terrible car crash with serious injuries. It deals with timely issues such as texting and driving. It deals with families and their love and support or lack thereof. It deals with loss and our response to it, healing from it, and even the ways God can use it for good. My favorite thing though? Elsie and Ruben. Elise is a "little person" and Ruben is quite the opposite from the description given. Each has had tragedy in their life. Each has dealt with comments and opinions from others about their appearance and their differences from the average person. Each has been hurt by that and each has some serious self image issues. As someone who also deals with self image insecurities and as someone who has been the brunt of the teasing and staring and comments? I could identify with the characters and so loved how they worked their way through those issues. The Amish stories aways seem to bring with them a picture of a world of peace, order, strong faith and simplicity. I think with my own life feeling chaotic this is one of the reasons I have been drawn to these stories and this one certainly filled that need. Looking forward to more good reading from Rosalind Lauer. Hope you will check it out too! This is the first book I have read by Rosalind Lauer and it sure won’t be my last. The characters in this book experience pain, deep heartache, loss, grief, and lack of faith. Does time really heal all wounds? Does God make mistakes? Have we ever felt unloved, lonely, and the desire to fit in? Elsie Lapp is a young lady who is experiencing all these things. As a young Amish girl she feels she can never marry, for who would ever want the likes of her? How can she marry wit God’s Grace Is Sufficient! Have we ever felt unloved, lonely, and the desire to fit in? Elsie Lapp is a young lady who is experiencing all these things. As a young Amish girl she feels she can never marry, for who would ever want the likes of her? How can she marry with the deep fear she is hiding? After all, this is God’s will for her life isn’t it? Ruben Zook is dealing with his own insecurities and so to make up for what he is feeling he is known as the practical joker and an irritating one at that. What, if anything, can make him change his behavior? Haley Donovan an English woman training to become a nurse wants to prove to her parents that she can make something of herself. Approval from her parents is very important to her. A broken engagement on her part doesn’t mean that she doesn’t have control of her life. Is there anyway she can convince her parents? Dr. Dylan Monroe, a psychologist, running away from his demons that are chasing him. A new start in Amish country is a new beginning for him. Will Halfway, the Amish community, accept him? Just what is Dr. Monroe running from? God’s healing power, his grace, his mercy, is at work in this story. Can lives be changed? I really enjoyed this book. It is a little different from most Amish fiction that I have read. I found that I wanted the best for every character in this story. They became like family to me. I am looking forward to the next book that author Rosalind Lauer publishes. I will also be purchasing her previous books to read. Her writing is that good! I won this book on LibraryThing and received my copy from Random House to read and review. The opinions expressed are mine alone. Haley Donovan is a nursing student; one evening, on her way home, she comes upon a scene of a tragic accident involving a van full of Amish passengers. She draws on her training to help them until the paramedics can arrive, and the experience wins her a place in Lancaster County's tight knit Amish society. She also becomes friends with the new psychologist in town, Dylan Monroe. With Haley's help, he works on gaining acceptance within the community and offers his counseling services for free for Haley Donovan is a nursing student; one evening, on her way home, she comes upon a scene of a tragic accident involving a van full of Amish passengers. She draws on her training to help them until the paramedics can arrive, and the experience wins her a place in Lancaster County's tight knit Amish society. She also becomes friends with the new psychologist in town, Dylan Monroe. With Haley's help, he works on gaining acceptance within the community and offers his counseling services for free for all those whose lives have been impacted by the accident. Haley feels an attraction between them, but senses that Dylan is holding back, scarred by the wounds of his past. Elsie Lapp is the manager of the country store, and has always been a voice of cheer and goodwill to her customers, but the serenity of the world spins out of control in the aftermath of the crash. Her burden is eased by Ruben Zook, a neighbor known for his jokes and pranks, but he reveals a more tender side to Elsie; however, he does not know that Elsie is carrying a secret that will prevent her from surrendering her heart. I really enjoyed this story, especially the character of Elsie. Elsie is a little person, and was born with a disorder called Ellis-Van Creveld Syndrome, a genetic disorder that is the most common among the Amish in Pennsylvania. It was interesting to read about how she found acceptance within her family and community, and how they did not treat her as if she were "different", but the story also explored the challenges she had to face living with EVC. Looking forward to reading the next story in this series. An excellent read, very pertinent in modern society although set deep in Amish country. I love books about the Amish! I live in So Central PA and encounter many as I travel! Great book! Originally reviewed at These Pretty Words. I cried. I cried so hard, I had no idea how to stop. And then I swooned, and then I cried again, and then I prayed and hoped and snuck my phone everywhere with me so I didn’t have to stop reading the ridiculously beautiful words contained within this 384 page blessing. Don’t bother waiting until the end of this review – go buy it right now. You won’t regret it. Let’s start at the beginning – A Simple Faith is a story of tragedy, healing, faith and hope, a Originally reviewed at These Pretty Words. Let’s start at the beginning – A Simple Faith is a story of tragedy, healing, faith and hope, and how one horrible accident affects not just the Amish people involved but the English (non-Amish) that weave their way into the lives of the Plain people in their community. It’s a story of the differences between us, and how we overcome them to come together and help one another. And it’s unbelievably gorgeous. We meet many characters along the way but there are two main stories happening in this book. On the Amish side we have the budding friendship between Elsie Lapp and Ruben Zook. Neither are picture-perfect on the outside which affects them each deeply, though they are at different places in their acceptance of their uniqueness. The slow build of their friendship from acquaintances to something so much more is a journey through tragedy and heartache, hope and renewal. Their story is a wonderful reminder that God makes us the way he wants us to be. Non-Amish Haley and Dylan also have a slowly built romance throughout A Simple Faith. Dylan is scarred and broken on the inside from personal tragedy – Haley is lacking confidence and unsure of her place in this world. Together they pull their new Amish friends through the deluge of negative emotions after a tragic accident while also working through their own issues. Both characters are relatable and true with big hearts and a strong foundation in faith that keeps them from giving up. I adored them. 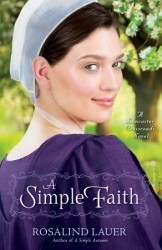 The most tragic of circumstances will bring together the Amish and the Englishers in "A Simple Faith", from author Rosalind Lauer. A van carrying a group of Amish people is hit head on by an SUV driven by a young Englisher woman texting on her cell phone. Later, the young woman will die at the hospital, leaving her mother distraught. Haley Donovan, a young nursing student, had actually witnessed the horrible accident. After calling 911 and describing the location and seriousness of the accident, The most tragic of circumstances will bring together the Amish and the Englishers in "A Simple Faith", from author Rosalind Lauer. A van carrying a group of Amish people is hit head on by an SUV driven by a young Englisher woman texting on her cell phone. Later, the young woman will die at the hospital, leaving her mother distraught. Haley Donovan, a young nursing student, had actually witnessed the horrible accident. After calling 911 and describing the location and seriousness of the accident, Haley had worked as fast as humanly possible, and with great care to assist the victims at the scene. She had also phoned Dylan Monroe, a psychologist new to area. His expertise and kindness would be of great help to the emotional recovery of the victims and their families. After some time at the hospital, the family of the man most seriously injured, Thomas Lapp, was told that he had no brain activity and the life support machines which were keeping him alive should be turned off. His daughter Elsie, who helped him run the family store, was especially stricken by the news. Elsie suffered from a genetic disorder which caused dwarfism and unevenly spaced teeth. Able to deal with customers and the public with ease, in her personal life Elsie had vowed never to marry and have children because she was afraid of passing along her disorder. Ruben Zook, considered to be somewhat of an odd character, though Elise was beautiful--inside and out--and he wanted to care for her. While Haley had done well at the scene of the accident, and later on at the hospital she had provided emotional support as well. In her own life she suffered from self-doubt that she would ever complete her nursing studies. Her growing friendship with Dylan was a source of comfort to them both, as Dylan fled life in the big city due to a family tragedy of his own. In this time of sorrow, can abiding faith and the true kindness of giving hearts bring healing and plant the seeds for happiness to come? "A Simple Faith" is a very poignant story, a reminder of the both the frailty and the beauty of life and love. This novel was VERY offensive to my inner-feminist. Now before you discount this review as being by someone crazy, know that I enjoy Amish lit. I find it soothing. I have always been fascinated by the Amish culture. Yet I was infuriated that every female in this novel - Amish or English (non-Amish) was EXPECTED to get married and have children. This was even worse for our 17-year-old protagonist Elsie who has some very valid reasons for not wanting to ever have children. (view spoiler)[ I was liv This novel was VERY offensive to my inner-feminist. Now before you discount this review as being by someone crazy, know that I enjoy Amish lit. I find it soothing. I have always been fascinated by the Amish culture. Yet her male love interest Caleb and her male Bishop believed that like any good Amish girl, she would come around. Men deciding what's best for a woman? Sounds familiar. Elsie wasn't allowed to remain Amish (as an adult) and not get married or have children. This infuriated me. This novel made the Amish lifestyle seem very sexist and backward. I also found this novel WAYYYY to Christian and preachy. While I expect this of the Amish characters, Haley suddenly becomes VERY Christian by the end of the novel and Dylan's Christian beliefs come out more and more as the novel progresses. The characters in this novel had some major challenges they had to deal with. This was written in an eloquent way but wrapped up far too easily and neatly. Everyone was paired up into couples and took a short number of pages to 'fall in love'? Ugh. Just ugh. Needless to say, I won't be reading the rest of the series or any more books by this author. This is the first time I have read a book by Rosalind Lauer. It will not be the last. I really loved this story. There are so many truly interesting and unique characters. The main characters are Haley Donovan, Dylan Monroe, Elsie Lapp, and Ruben Zook. The book begins with a tragic traffic accident. The lives of the Amish residents of Halfway, Lancaster County, are forever changed in a heartbeat. Haley is a nursing student who witnesses the wreck and helps the victims. She is a caring woman who t This is the first time I have read a book by Rosalind Lauer. It will not be the last. I really loved this story. There are so many truly interesting and unique characters. The main characters are Haley Donovan, Dylan Monroe, Elsie Lapp, and Ruben Zook. The book begins with a tragic traffic accident. The lives of the Amish residents of Halfway, Lancaster County, are forever changed in a heartbeat. Haley is a nursing student who witnesses the wreck and helps the victims. She is a caring woman who the Amish accept and welcome. Dylan Monroe is a psychologist who is hiding a heartbreaking past, or rather trying to escape that past. He will not allow anyone to get close to him, yet Haley feels deep affection for him. Elsie Lapp is a young woman of Amish faith who is also struggling with a heartbreaking physical condition. Ruben Zook as very much attracted to Elsie. She loves him, but has vowed never to marry. Ruben is the last person Elsie expects to comfort her. They grow closer and come to depend on one another. Both couples try to deny their hearts the love which so obviously surrounds them. Both face deep hurt and past fears in order to move on with their lives. All of the characters are forever intertwined in each others lives. From a terrible tragedy to a simple act of faith, they are led to find the power of love and reclaim their personal faith. I found this book to be an inspiration, a tearjerker, and a very sweet story. I can't wait to find out what happens to other character in future books in the Lancaster Crossroads series! My first experience with the writing of Rosalind Lauer has turned me into a fan! Rushing to the scene of a tragic highway collision, nursing student Haley Donovan draws on her training to care for the passengers in the crumpled van. The experience wins her a place in Lancaster County's tight-knit Amish society, and draws her to kindhearted psychologist Dylan Monroe. Working side by side with Dylan who is bringing counseling services to the small town of Halfway, Haley feels an undeniable attraction between them, yet she senses that Dylan is holding back, scarred by the wounds of his past. Elsie Lapp, the manager of Halfway's country store, is a voice of cheer and goodwill for her customers. But Elsie's serene world spins out of control with the terrible crash, and the young woman finds herself grappling for the simple faith that has always sustained her. Her burden is eased by Ruben Zook, a neighbor known for his snide jokes. In the aftermath of the accident, Ruben reveals a tender heart that could easily sweep her away. However, Elsie carries secrets that keep her from surrendering her heart. Exploring the ways that faith, hope, and charity bring everyone together, A Simple Faith resonates with the sweetness, purity and power of love. Haley Donovan is hoping work in Halfway's Hospital will allow her to forget about her past and move on to the future. When she meets Dylan who is the new counselor for the hospital she notices he is cute and out of place but she just keeps to her self and does her job. Elsie Lapp who manages her families store wants help her family with finances so she suggests that she visits the city to talk to a vendor. Little does Elsie and Haley know they will be crossing each others paths and both be invol Haley Donovan is hoping work in Halfway's Hospital will allow her to forget about her past and move on to the future. When she meets Dylan who is the new counselor for the hospital she notices he is cute and out of place but she just keeps to her self and does her job. Elsie Lapp who manages her families store wants help her family with finances so she suggests that she visits the city to talk to a vendor. Little does Elsie and Haley know they will be crossing each others paths and both be involved in a tragedy that will connect them for life. I received this book courtesy of Netgalley. It was the first book that I have read of Rosalind Lauer's so I was unsure of what the writing and story were going to be like. I was very impressed with her story and writing. I thought the book had great characters that were developed very well. I felt she did a good job of describing them so well that you felt like you knew exactly who they were. In addition the book did a very good job of showing how the Amish connect with society. Another aspect of the book that really grabbed my attention was how she had to point of views guiding the book. It really helped when they had the tragedy in the book occured. You were able to see the two point of views of how the Amish deal with tragedy and how the rest of society deals with it. I am very glad that this book is a part of a series because I would like to learn more about the other characters in the book. I have discovered a wonderful new author in Rosalind Lauer and I have four books, so far, of hers – two from her previous series and two from this one. I’ve had to check a couple out at the library but I’m watching for sales at the local Christian Book Stores. And I will be reviewing the second book in this series soon. Rosalind Lauer is an exceptional author. Even having read her first series, I was not prepared for how great this book would be. It’s a great read! I will say that I’m a bit confuse I have discovered a wonderful new author in Rosalind Lauer and I have four books, so far, of hers – two from her previous series and two from this one. When nursing student Haley Donovan witnesses a tragic car accident she doesn't realize it will change her life forever. The accident not only draws her close to the Amish victims including Elsie Lapp but psychologist Dylan Munroe. Haley soon realizes she is falling in love with Dylan but will he be able to love her back? Elsie has her own issues - because of a genetic disorder she has vowed to never fall in love or have children but she doesn't realize that she can't control her heart no matter When nursing student Haley Donovan witnesses a tragic car accident she doesn't realize it will change her life forever. The accident not only draws her close to the Amish victims including Elsie Lapp but psychologist Dylan Munroe. Haley soon realizes she is falling in love with Dylan but will he be able to love her back? Elsie has her own issues - because of a genetic disorder she has vowed to never fall in love or have children but she doesn't realize that she can't control her heart no matter how hard she tries. “A Simple Faith” is an at times heartbreaking yet uplifting novel about love, both the sorrow and joy of it. Author Rosalind Lauer tells stories from two different worlds - the Amish and the English – yet they have more in common than they may think. The two romance storylines (Haley/Dylan and Elsie/Ruben) are very different yet also similar as both Dylan and Elsie are afraid to open their hearts to love. Both storylines are well done and I can't really pick a favorite of the two. While there is a great deal of sadness in the book (keep a box of tissues nearby) there is also a great deal of hope and faith. Lauer has created some wonderful characters that you will laugh and cry with. There is a wonderful twist at the end of the book left me with a delightful smile on my face. A Simple Faith by Rosalinda Lauer was won me by from the Goodreads First Reads Giveaway and the generosity of the author. The mix of emotions and personalities of the Amish and Englisher characters as they learn to help and depend on each other when a van full of Amish are involved in a traffic accident and the first and only person is Hailey, a young nursing students at the local hospital. Both communities learn from each other how to deal with the death of the driver of the other car and one of A Simple Faith by Rosalinda Lauer was won me by from the Goodreads First Reads Giveaway and the generosity of the author. The mix of emotions and personalities of the Amish and Englisher characters as they learn to help and depend on each other when a van full of Amish are involved in a traffic accident and the first and only person is Hailey, a young nursing students at the local hospital. Both communities learn from each other how to deal with the death of the driver of the other car and one of men in the van and the injuries of two others, plus the post traumatic trauma they all suffer and help each other heal. I love reading Amish books but had never read one by Rosalind Lauer, after reading A Simple Faith I will have to say this won't be the last time I read her books. Have the kleenex ready, as there are both sad and happy times in a Simple Faith. And how we use the strength of God to get through these times. A tragic car accident brings the Amish and English together in the start of this story. I love the way Rosalind Lauer shows that faith, hope, forgiveness, and love bring people closer together. She does a great job of telling the love story of both an Amish (Elsie/Ruben) and an English couple (Haley/Dylan). I enjoyed all of these characters, not sure if I have a favorite of the characters, they are all great. I learned about Ellis-Van Creveld Syndrome (EVC) which Elsie has, and Ruben shows a very tender side and big heart when it comes to Elsie. A Simple Faith by Rosalind Lauer is a welcome trip back to Halfway Pennsylvania. We were first welcomed to Halfway and the King family in a Simple Winter. Although the King family makes a cameo this story features nursing student Haley Donovan and psychologist Dylan Monroe. On her way home from the hospital Haley witness an accident between an SUV and a van full of Amish. Elsie Lapp and Ruben Zook were passengers on the van. A Simple Faith is the story of how Englishers and Amish deal with the a A Simple Faith by Rosalind Lauer is a welcome trip back to Halfway Pennsylvania. We were first welcomed to Halfway and the King family in a Simple Winter. Although the King family makes a cameo this story features nursing student Haley Donovan and psychologist Dylan Monroe. On her way home from the hospital Haley witness an accident between an SUV and a van full of Amish. Elsie Lapp and Ruben Zook were passengers on the van. A Simple Faith is the story of how Englishers and Amish deal with the aftermath of the accident. “A Simple Faith” by Rosalind Lauer was a very good book to read during the Christmas season. Although it had nothing to do with Christmas it did convey the spirit of giving and receiving as well as trying to have faith and hope when the odds are against you. Elsie is a little person and has vowed not to have children because she is afraid that they will inherit her condition. However, Ruben is not accepting her decision. Elsie and Ruben were in a car accident along with her Dad and others in thei “A Simple Faith” by Rosalind Lauer was a very good book to read during the Christmas season. Although it had nothing to do with Christmas it did convey the spirit of giving and receiving as well as trying to have faith and hope when the odds are against you. Elsie is a little person and has vowed not to have children because she is afraid that they will inherit her condition. However, Ruben is not accepting her decision. Elsie and Ruben were in a car accident along with her Dad and others in their community. Elsie’s father was killed as was the other driver. This book also looks at how post-traumatic stress can affect so many people after a horrific incident. This story was very comforting in the way the characters began to see how it is possible to overcome a tragedy with hope and love. I was sent a free print copy of this book by Night Owl Reviews in return for my honest assessment of the book. I started this book before bed expecting to read a few pages before following asleep. Instead, I stayed up until the wee hours of the morning turning page after page in order to find some semblance of happy and happiness in this tragic tale. I certainly plan to read more of Lauer’s books as this was exactly what I needed following my long excursion into Westeros and the land beyond the Wall. The book is rather evenly split between the story of Haley and Elsie, and while Haley grabbed my attention I started this book before bed expecting to read a few pages before following asleep. Instead, I stayed up until the wee hours of the morning turning page after page in order to find some semblance of happy and happiness in this tragic tale. I certainly plan to read more of Lauer’s books as this was exactly what I needed following my long excursion into Westeros and the land beyond the Wall. I enjoyed getting to know the people in the town of Halfway, despite the fact we meet them in the aftermath of a horrible accident--one that forever changes their lives through the bond of death. If you've noticed the books I've read, or follow my blog, then you know that I have a soft spot for stories involving the Amish. I love to learn about their customs and I learn a lot from their unwavering faith in God and His promises--much like Haley and Dylan did when they befriended Elsie, Ruben, and I enjoyed getting to know the people in the town of Halfway, despite the fact we meet them in the aftermath of a horrible accident--one that forever changes their lives through the bond of death. If you've noticed the books I've read, or follow my blog, then you know that I have a soft spot for stories involving the Amish. I love to learn about their customs and I learn a lot from their unwavering faith in God and His promises--much like Haley and Dylan did when they befriended Elsie, Ruben, and the other Halfway townspeople. I enjoyed this story. Rosalind Lauer is an excellent writer who is very good at describing her characters and their struggles to rebuild their lives after a terrible accident that had very devastating consequences for all of those who were involved. I am looking forward to reading the next book in this series, A Simple Hope, which is scheduled to be released on March 4, 2014. This was my first book by Rosalind Lauer and it will definitely not be the last. I found "A Simple Faith" to be an interesting Amish story that mixed in Amish culture and Englishers in one story. Several lives are turned upside down when there is an accident and the Amish pull together along with some new Englisher friends. This is a story of faith, friendship, love, hope forgiveness and hurt. I recommend this story to others, you won't be disappointed. I'm so glad I won this from Library Thing's This was my first book by Rosalind Lauer and it will definitely not be the last. I found "A Simple Faith" to be an interesting Amish story that mixed in Amish culture and Englishers in one story. Several lives are turned upside down when there is an accident and the Amish pull together along with some new Englisher friends. This is a story of faith, friendship, love, hope forgiveness and hurt. I recommend this story to others, you won't be disappointed. This had a different slant the n Amish genes and sorrow. Amazing how they work as a community. It has a section about non Amish falling n love. I really didn't see any purpose in that part. this book was really well written and this is the first time I have read an Amish book that actually includes Englishers and the Amish. I totally enjoyed this read and will so start the second book. Rosalind Lauer shows how the Amish people can have forgiveness in their hearts...Something I think we all should practice. Great story & I definitely will read the next book in the series. This book was more English than Amish for my liking. An enjoyable read ... will look for more books by this author! Would definitely recommend this book to anyone!